"In the wonderful world of nail polish, 'underwear' is the color you use under another color as a layering tool. Every fashionista knows that her underwear can make or break and outfit. So we went through the vaults and found the best for you." 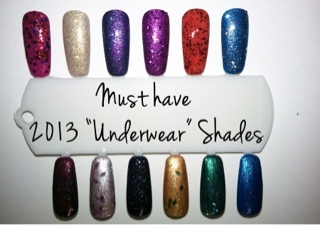 Here are the top 13 must-have underwear shades for 2013 from Pure Ice! 13. must-have underwear is Black Rage 980 - A classic creme black that is the perfect for all occasions. So it seems as though if you weren't able to get your hands on some of those beautiful velour finish polishes I've been sharing with you all they will be rolled out again pretty soon! Which ones are catching your eye?